About a year after the introduction of the NeoCash Mall TNT brought out NeoCash Cards. NeoCash Cards are store-bought gift cards and give out special prizes when you redeem them, in addition to the NeoCash you've paid for. There are multiple different kinds of cards available - regular NeoPets cards, PetPet Park cards and Nickelodeon Game Cards. All the cards work in the same way, though they tend to award different prizes based on their type. These cards also come in various designs that depend on the type of card and where it's purchased. The lure of buying NeoCash cards lies in the extra prizes awarded on redemption. 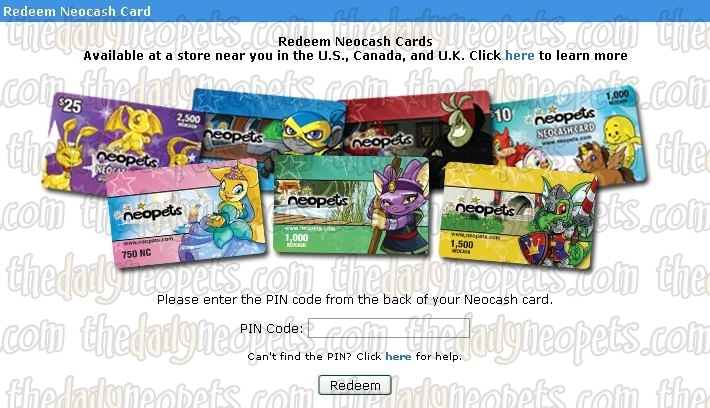 Every card gives out a special item when you redeem it - initially these were NeoPoint wearables, though TNT later rethought this as now the prizes are NeoCash wearables - as well as Basic Gift Boxes which can be used to send NeoCash items to other accounts. Quite useful for trading with other users. The $25 NeoCash cards also award an extra 150 NC free. The now-retired Boxed NeoCash Cards also awarded a Key Quest Case Theme. These cards are no longer available in stores however. Where Are NeoCash Cards Available? NeoCash Cards are available in many different countries - including the United States, Canada, the United Kingdom, Australia, New Zealand and Mexico. It is recommended that you scratch the area with a coin, so as to avoid destroying the code underneath. Once you have your code, head over tothis page so that you can input it. Once here input the code on the back of your card into the box after the words "PIN Code" without spaces or dashes and click "Continue". After that you will be taken to a Rules and Conditions page, where you need to tick the "I Accept" box and then click "Next". And thats it! You will receive your bonus prize, and the apporpriate amount of boxes for the card redeemed. After that if you have another card, click "Redeem Another Card" if you are done, click "Start Shopping". One of the more convenient ways to buy NeoCash is to purchase it online at the NC Mall and pay using your Credit Card or Paypal account. To purchase your NeoCash online through the NC Mall click on the yellow Buy NC button along the panel on the left side of the page. Then you have to select how much NeoCash you would like to purchase. Currently there is only 4 choices available. Select the amount of NeoCash you would like to purchase and click the Next button. Before Clicking Next you have the option to change your location if it is listed as a different country then where you are currently residing. Also All NeoCash purchases are final and non-reundable. Make sure you really want to purchase the amount of NeoCash before proceeding. You will now have the option to review your order and change it if necessary. TNT also warns that additional charges may be added to your order total. Certain methods of payment have special surcharges and/or taxes which may increase the total amount of your order. If any additional charges are to be added you will be informed prior to completing your order. The next step is to choose which method you would like to use to pay for your NeoCash. Credit Cards ~ Currently you can use major credit cards such as Visa, MasterCard, American Express, and Discover Card to purchase NeoCash. When using a Credit Card you have to be at least 18 years old or have clear consent and assistance from a parent to use their credit card. PayPal ~ A PayPal account can also be used to purchase NeoCash. When using a PayPal account you need to be at least 18 years old or have clear consent and assistance from a parent to use their PayPal account. Once you have chosen your payment option click the next button and you will be redirected to the payment processing page. On this page you will have to enter your Credit Card or PayPal account information depending on which one you are using. You will also need to enter in your billing address. When you are finished look your information over and make sure it's correct before submitting your order information. Follow the remaining on screen instructions to complete your NeoCash purchase. After your payment has been processed you will receive a neomail from TNT to notify you that the amount of NeoCash you purchased has been added to your account and you are now able to spend it. The Snowager is awake. He'll be sleeping in 5 hours, 35 minutes.